Fans of mythology and spectacle rejoice: The Cabiri is back with EZID, the second installment of an epic mythological trilogy, running June 12-13, 18-20 at the Cornish Playhouse. SeattleDances caught up with John Murphy, Artistic Director, and Charly McCreary, a Principal Artist of The Cabiri, as they entered tech week. The Cabiri’s mission is to “preserve the mythologies of extinct and endangered cultures,” and this time their source material draws from over 8,000 years of mythology, ranging from Anatolia to North Africa. Not to worry, says McCreary, for those who missed the first installment, TEWAZ: this production features new characters and a new story, and it takes place a few generations later in the complex folklore drawn from the ancient cultures in what is now Kurdistan. A cast of nearly 30 dancers, gymnasts, and aerial artists depict this tale of good and evil, angels and demons, set to a semi-improvisational score played by four live musicians led by Constantin Parvelescu. This gargantuan production features video projection designed by Leo Mayberry, of Killing Frenzy Visuals and also giant, sixteen-foot tall puppets that engage in a larger-than-life battle sequence. “Our performers are wide-range generalists,” says Murphy. Dancers join with contemporary/modern backgrounds and The Cabiri trains them in aerial work. For specific lead roles, however, the company brings in specialists. Pointing to a complicated rigging hanging high above the Playhouse’s stage, McCreary explains that the featured aerialists choreographed their own solos, while Cyrus Khambatta (of Khambatta Dance Company) created the ground choreography. EZID showcases soloists on aerial chains, hoops, fabric, and even some apparatus designed especially for the show, such as a twisty structure for McCreary’s snake demon character. After vaulting onto the stage to test the chains, swinging and wrapping himself in the unforgiving links, Murphy adds that only about four or five artists in the world can perform on this apparatus. 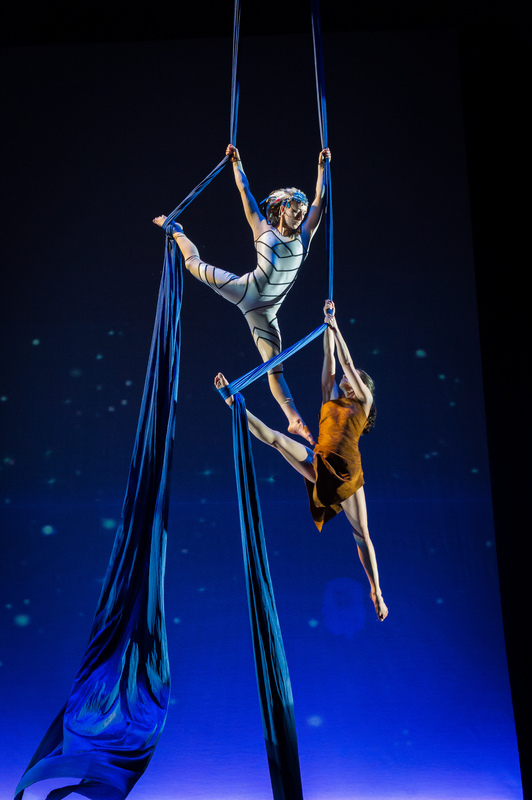 The difference between The Cabiri’s productions and traditional American circus is that, rather than being act-based, EZID consists of a cohesive whole, acrobatic theater that emphases telling a story, instead of making the audience focus on the feats of the individual performer. During his research process for this show, Murphy lived in Iraq for three months, learning about the Yezidi culture while also helping refugees in camps and villages. The company has been rehearsing this production since April, and Murphy proudly explains just how far the company has come since its inception in the mid-nineties. After quitting his job as a molecular biologist, Murphy became a street performer, busking for change. It was not until a homeless person gave him 75 cents (which he still keeps as a memento) that he became inspired to start an acrobatic theater company. The company grew, became a non-profit in 2001, and now is a six-figure company. Murphy points out individual dancers and their accomplishments. Two dancers who are also UW students received scholarships this year, and Murphy is proud to see his dancers step up into leadership roles. “If I need to make changes,” he says, “I just send it out to the group and they make it happen.” While at first, Murphy and McCreary built everything themselves, Murphy says that now The Cabiri is becoming more of a collective. Storytelling aside, EZID also provides spine-tingling adrenaline, which we got a hint of while watching Principal Artist Erica Sherman rehearse an exit. Sherman gracefully places her hands upon a hoop, whispers “up!” and ascends higher and higher, until she disappears into the ceiling. She doesn’t come down until McCreary calls the cast together to give notes several minutes later. While there are some scary themes, this family-friendly show is suitable for ages 6 and up, appropriate if the child can watch Harry Potter, for example. “Lots of kids came to the first installment and loved it!” McCreary says. Murphy adds that, “the Cabiri is unlike anything you’ll ever see anywhere else.” EZID’s feats of acrobatics, intricate dance, lively music, and an exciting story is sure to dazzle child and adult alike. For more information on The Cabiri click HERE. For tickets to EZID click HERE.